Interested in planning a party today? 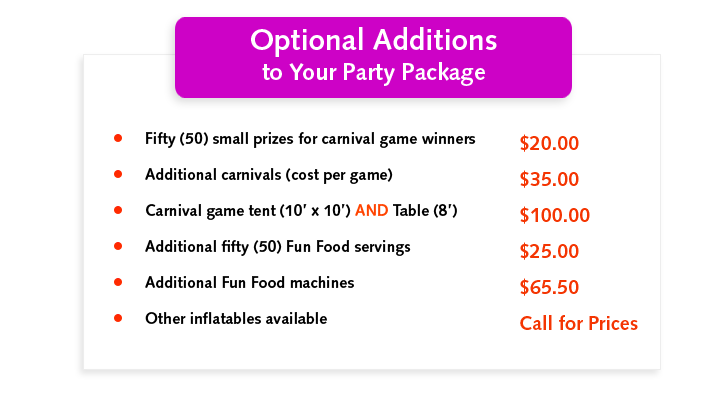 Irwin’s Parties offer eight different Party Packages that are tailored to entertain up to 30 kids, as well as special pricing tailored to fit your event needs. Scroll below to view packages, custom additions, explanations of package items, and accompanying terms. Need help customizing your party? Email Irwin! Let's talk about how we can kickstart your event! 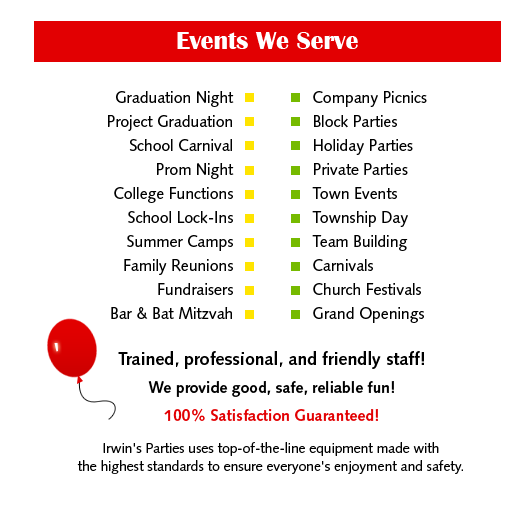 For over a decade, Irwin's Parties has happily been serving New Jersey and New York. 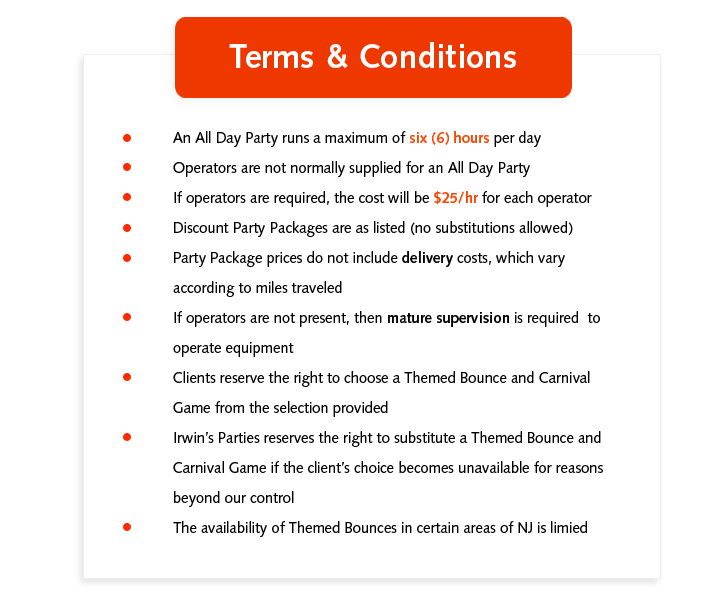 State-permitted, insured and experienced, Irwin's Parties is committed to bringing the amusement park right to our clients' doors. We firmly believe that fun is for all ages! We’ve served a variety of events over the years, bringing smiles and laughter to all kinds of surroundings, including events such as: birthday parties, fundraisers, bar and bat mitzvahs, corporate parties, church festivals, project graduation, and many more. Our motto is good, safe, and reliable fun for all! Our trained, professional and friendly staff and top-of-the-line equipment means highest standards to ensure everyone’s enjoyment and safety. Browse our site to view our available party and events equipment selection, which ranges everything, including: inflatables, arts and crafts, old-school superfun dunk tanks, state-of-the-art virtual entertainment and outdoors furniture to support guests. We also offer party packages and discounted pricing customized for your event. Interested in planning your party today?